Author: Stephanie Polites, M.D. General Surgery Resident. Mayo Clinic. Acute appendicitis is the most common surgical emergency in children and accounts for many emergency room visits and hospitalizations in the pediatric population. Traditionally, the diagnosis was made based on history and physical exam, with use of advanced imaging such as ultrasound or computed tomography (CT) reserved for equivocal cases. Now that CT is readily available in most emergency departments, there has been a substantial increase in CT utilization. CT is more than 90% accurate in diagnosing acute appendicitis and providers hope its utilization will avoid negative appendectomies. Unfortunately there may be a long term risk of cancer associated with ionizing radiation exposure due to CT. Furthermore, there is evidence that CT utilization does not prevent negative appendectomies. The pediatric surgeons, pediatric emergency medicine physicians, and radiologists at our institution collaboratively developed a diagnostic algorithm aimed at reducing CT utilization, reserving it only for those patients whom the pediatric surgeon felt CT was warranted. We then studied the effectiveness of the algorithm in changing practice in our emergency department and in decreasing CT utilization. We identified all children who underwent appendectomy for acute appendicitis diagnosed in our emergency department for two years before and three years after algorithm implementation in January, 2010. CT utilization decreased from 38% to 18% (p<.001). 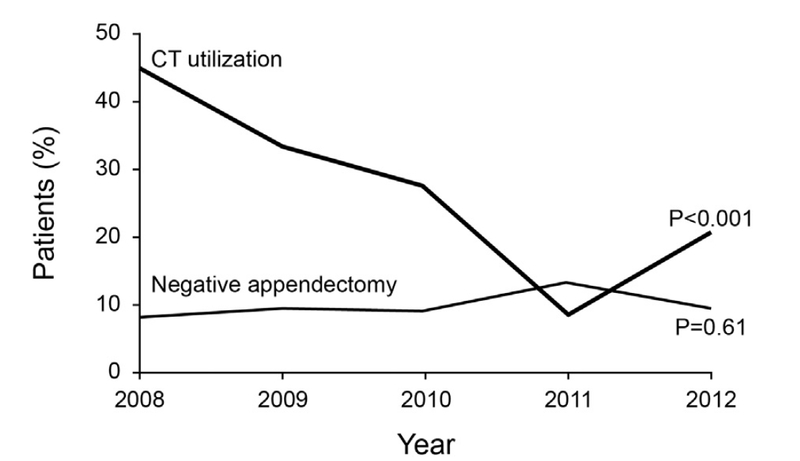 More importantly, the negative appendectomy rate did not increase despite more than a 50% reduction in CT use. Not only did this study demonstrate that multidisciplinary protocols can facilitate swift practice change, but that CT can be safely avoided in most children with suspected acute appendicitis. Polites SF, Mohamed MI, Habermann EB, Homme JL, Anderson JL, Moir CR, Ishitani MB, Zarroug AE. 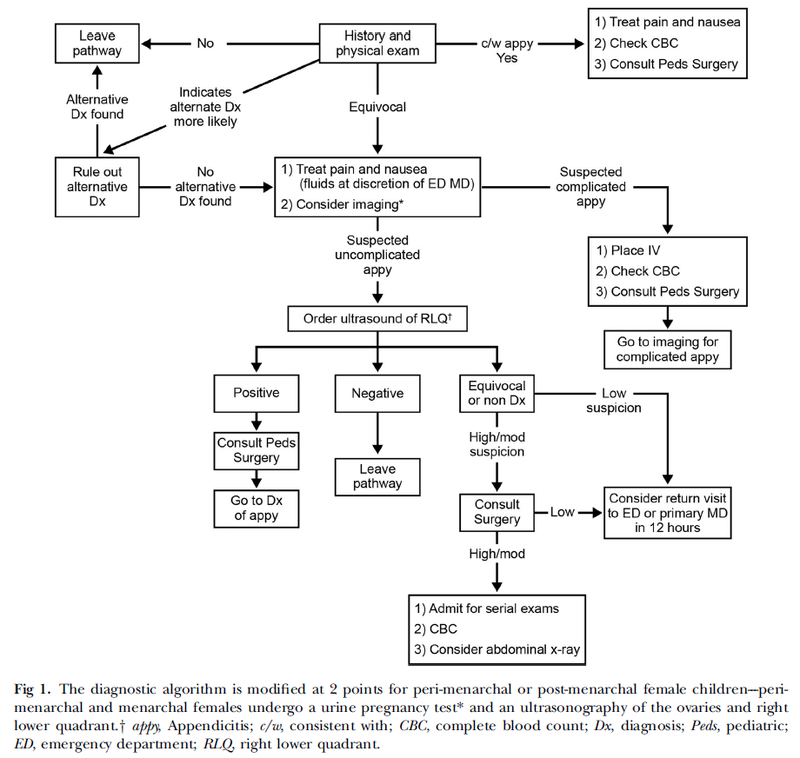 A simple algorithm reduces computed tomography use in the diagnosis of appendicitis in children. Surgery. 2014 Aug;156(2):448-54. doi: 10.1016/j.surg.2014.04.001. Epub 2014 Jun 19. PubMed PMID: 24953265.